The International Space Station's new Tranquility module is moved to the port side of the Unity node on the station during an overnight spacewalk that began Feb. 10, 2010 on NASA's STS-130 mission. The International Space Station just got roomier. Astronautsopened the orbiting laboratory?s brand-new room late Friday and quickly got towork moving things in. 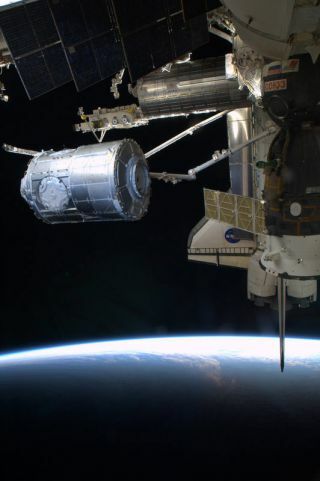 The new Node3 module, named Tranquility in honor of NASA?s Apollo 11 moon base, wasopened with little fanfare at 9:17 p.m. EST (0217 Saturday GMT) by all 11astronauts on the linked space station and shuttle Endeavour. ?Houston, Node 3 is open,? Endeavour pilot Terry Virtsradioed to Mission Control. ?It looks really nice in there and we?re gettingback to work.? The new module and its seven-window observation decklaunched to the station on Monday aboard the shuttle Endeavour, which arrivedat the orbiting laboratory two days later. It was installed the nearly 24-foot (7-meter) long room duringa spacewalk that began late Thursday, but the astronauts did not hook up thevital cooling system plumbing needed to fully activate the new room. That comesduring the nextspacewalk set for late Saturday. The astronauts used flashlights Friday to see inside the darkTranquility module. They wore goggles and face masks as protection against anydust or debris that had shaken loose during the module?s trip to space. "The module looks beautiful and the atmosphere isvery clean," said station commander Jeffrey Williams of NASA. Williams said he saw no dust or debris after opening thestation?s newest room. He and his crewmates will hook up power lines and waterhoses, and are expected to move the first large pieces ? a big exercise machineand an air recycling system ? into Tranquility overnight. The $382 million Tranquility module and observation deck,called the Cupola, are NASA?s last major additions for the space station. Theyare attached to the left side of the station?s central Unity node. With them installed, the space station is now 98 percentcomplete and weighs nearly 800,000 pounds (362,873 kg). The $100 billion spacestation has been under construction since 1998 and is the result ofcooperation by 16 different countries. The seven-window Cupola includes a huge round centralwindow that is the largest space window ever launched. The $27.2 million window set was to be opened late Fridayfor just a short while, and then shut tight again until it can be moved fromthe end of Tranquility to an Earth-facing berth. NASA has said it will provideunparalleled panoramic views of the planet from space. The orbital work to activate Tranquility came just hoursafter NASA cleared the shuttle Endeavour?sheat shield of any concerns. Three minor defects in the shield, spotted in photographsof the nose and left wing, are too small to pose any damage risk to theorbiter. NASA has kept a close watch on shuttle heat shield healthsince a piece of debris led to the destruction of shuttle Columbia duringre-entry in 2003. A final, standard inspection of Endeavour's heat shield willbe conducted by shuttle astronauts once the orbiter leaves the station nextweek. SPACE.com is providing complete coverage ofEndeavour's STS-130 mission to the International Space Station with ManagingEditor Tariq Malik and Staff Writer Clara Moskowitz based in New York. Click herefor shuttle mission updates and a link to NASA TV.